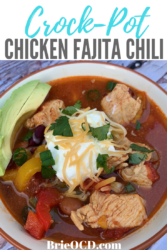 This chicken fajita chili is oh so tasty! It is SUPER EASY to make and once you throw it in the crock-pot you literally set it and forget it! 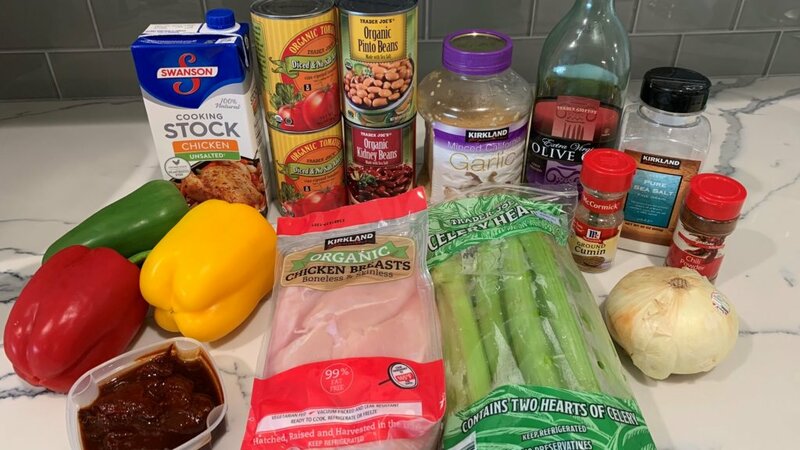 I was inspired by the Cooking Light Steak chili recipe but wanted to make this heartier, healthier and much easier (are you surprised?!). Another perk is this recipe is gluten-free! 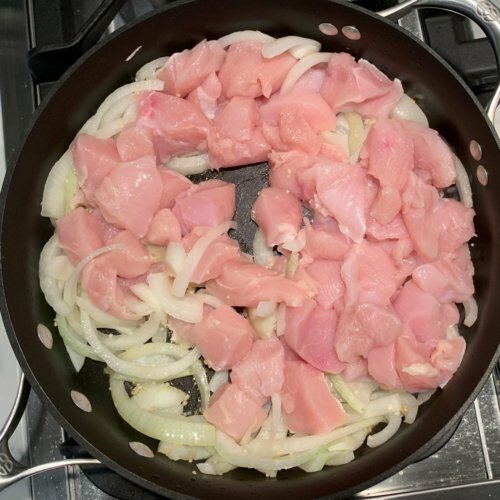 The main components are chicken, beans, bell peppers and spices so you are good to go! Per serving (about 2.5 ladel scoops) this recipe has 372 calories, 5g of fat, 39g carbs and 43g protein! That is low fat and protein packed! The carbs come from the veggies and beans so you could always reduce those by eliminating one can of beans if you so choose. If you add all the toppings suggested then add 45 calories, 3.5g fat, 2.5g carbs and 1.6g protein to the stats above. 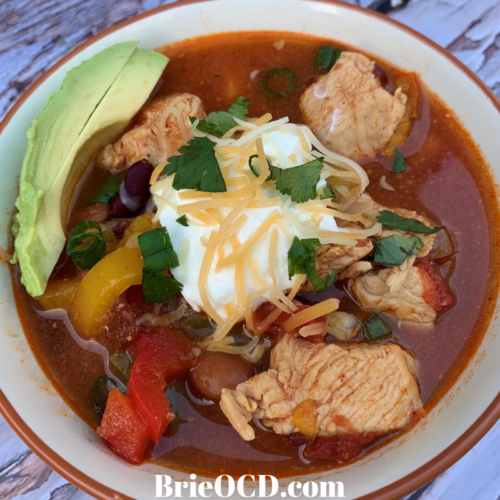 This chicken fajita chili has a little kick to it! I love it! However if you can’t take the heat then simply reduce the chili powder (or just eliminate it all together) and don’t use the adobo chilis. Easy Peasy! The greek yogurt and avocado topping also help to cut the heat. Greek yogurt is such a great alternative to sour cream. 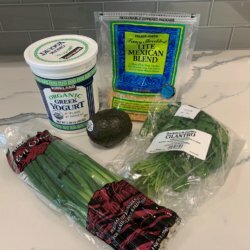 It is much healthier for you, packs some serious protein and gives you all the cream and texture of regular sour cream without all the fat and calories. As mentioned above, I recommend a bunch of toppings to spruce up this delicious recipe. Avocado and lite shredded cheese is my favorite. I could do without the rest but those two? Don’t make me! They just make the overall dish more fun, add healthy fats and of course, more color! If you are looking to reduce your fat content then I don’t suggest adding the avocado. If you are looking to up your protein for for the day then throw some greek yogurt on that baby! Either way you serve this dish, it is delicious and filling! Hope you enjoy as much as we did! 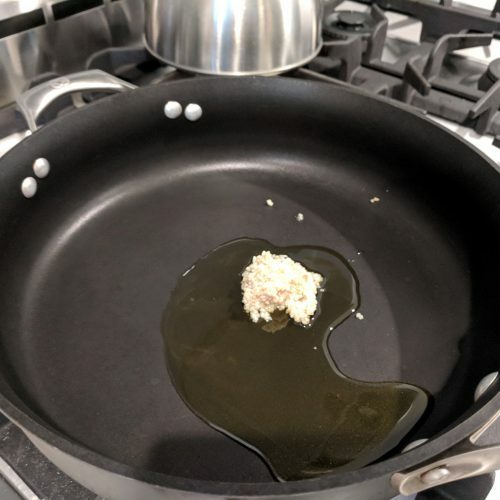 in a saute pan over medium high heat, heat olive oil for approximately 30 seconds. add minced garlic for another 30 seconds. 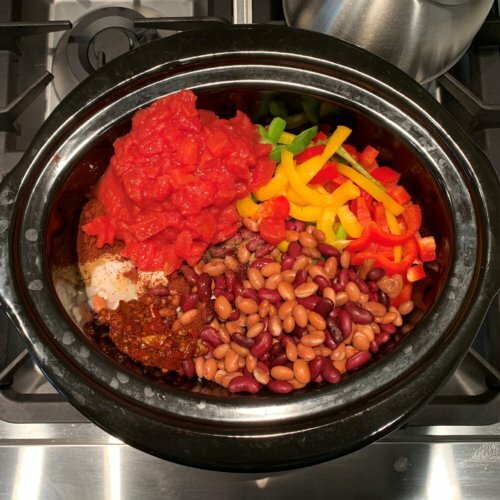 add all contents to the crock pot (excluding toppings). Stir, cover and set on low for 6 hours. top with toppings if desired and mangia!